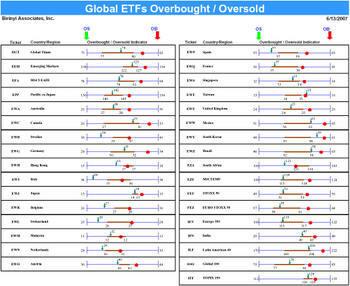 Below we feature a familiar Overbought/Oversold analysis for selected global ETFs. For those who may not be familiar with the chart, the blue range (with extremes at each end) represents the theoretical high and low for each ETF. Theoretical highs and lows adds, or subtracts, the greatest standard deviation the ETF has traded from its 50-day moving average in the last year to its current 50-day moving average. The thick red line represents the normal trading range (one standard deviation above and below the 50-day moving average). The current price is shown and represented by an arrow, the price five days ago is represented by the red dot. This information is processed for a variety of large cap names and ETFs every morning for Birinyi Mini Institutional clients.